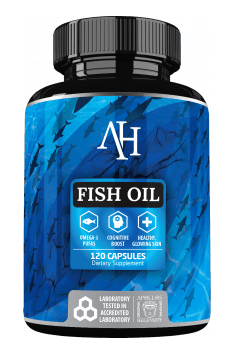 Apollo’s Hegemony Fish Oil is a dietary supplement containing fish oil, a source of polyunsaturated fatty acids omega-3 – eicosapentaenoic acid (EPA) and docosahexaenoic acid (DHA). The preparation supports the normal functioning of the circulatory system, improves the health of the brain, reduces inflammation, and helps to enhance the overall health of the organism. Essential fatty acids (EFAs) must be regularly supplied with food, as the human organism does not have enzymatic systems that would allow their synthesis. Omega-3 fatty acids are compounds of the EFA group, whose common feature is the location of the unsaturated bind in the molecule – the third to last carbon atom. Omega-3 EFAs include α-linolenic acid (ALA), eicosapentaenoic acid (EPA), and docosahexaenoic (DHA). 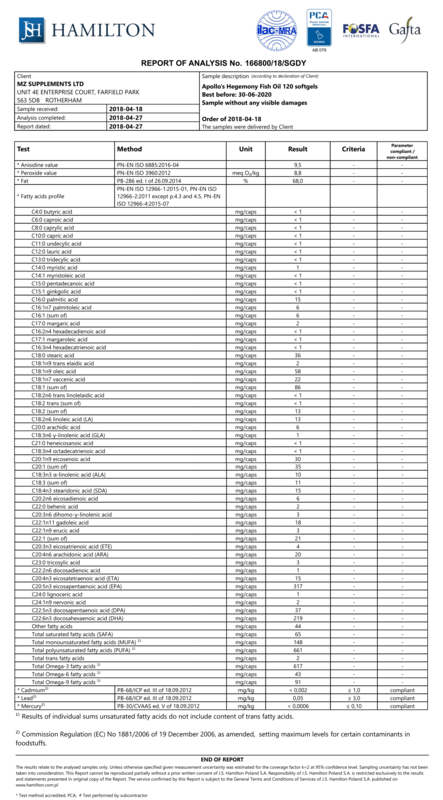 EPA and DHA are active compounds formed out of ALA. The conversion of ALA takes place in the organism thanks to the activity of elongases and desaturases mainly in liver cells; however, the efficiency of that reaction is not very high. Moreover, the same enzymes participate in the pro-inflammatory conversions or omega-6 fatty acids, which compete with omega-3. High consumption of products rich with omega-6 fatty acids additionally limits the effectiveness of ALA conversion to EPA and DHA. The best source of EPA and DHA is fish oil. Supplementing EPA and DHA makes it possible to skip enzymatic transformations and enables the direct use of the fatty acids by the organism. EPA and DHA are precursors of the synthesis of eicosanoids – prostaglandins, prostacyclins, leukotrienes, thromboxanes, and lipoxins. They are topically active autacoids with a wide range of effects on the organism. The products of EPA and DHA metabolism reduce the production of pro-inflammatory factors, such as IL-1 and TNF-α, and exhibit antiaggregant and anticoagulant properties. They reduce blood triglyceride levels and arterial blood pressure. Omega-3 fatty acids support faster post-workout muscle regeneration. It has been demonstrated that taking omega-3 after an intensive training helps to reduce delayed onset muscle soreness (DOMS) and helps to reduce inflammatory markers. Heavy physical effort leads to muscle protein micro-damage and, consequently, an inflammatory reaction. Thanks to their anti-inflammatory properties, omega-3 fatty acids can speed up muscle regeneration and restore their top functionality. Omega-3 supplementation prevents the development of circulatory system diseases. The anticoagulant properties of EPA and DHA reduce the risk of intravascular coagulation. It is possible thanks to a few factors, one of them being the inhibition of the production of thromboxane A2 and the platelet-activating factor. Moreover, EPA and DHA optimise blood lipid levels. They reduce the concentration of triglycerides and exert an anti-inflammatory effect, which is highly desirable in terms of the prevention and therapy of cardiovascular system diseases, such as coronary heart disease or atherosclerosis. Supplementation with omega-3 fatty acids helps to restore normal body mass in overweight people. Tests have revealed that obese people have low omega-3 levels. Supplementing the diet with EPA and DHA helped to reduce the feeling of hunger, increase satiety and speed up metabolism, which had a positive effect on body mass reduction. Overweight and obesity can lead to the development of the metabolic syndrome, type 2 diabetes, or circulatory system diseases. EPA and DHA can, therefore, prevent the development of those diseases. Docosahexaenoic acid is an element of phospholipids in cell membranes in the entire organism. It is the main structural element of cell membranes in the cerebral cortex and retinal photosensitive cells, responsible for the ability to see at night and perceive colours. DHA has been shown to stimulate nerve cell growth. Insufficient DHA supply in seniors increases the risk of nervous system disorders and is connected with the development of degenerative diseases. It is particularly important that pregnant and lactating women and babies receive optimal amounts of EFAs. Significant amounts of DHA can be found in breast milk. The compound has a crucial role in the development of the brain, particularly in foetuses and babies up to 2 years old. DHA deficiencies lead to changes in the composition of cell membranes in the brain and the retina, which can cause disorders in the intellectual and physical development of babies and children. To sum up, Apollo’s Hegemony Fish Oil is a dietary supplement recommended for people who eat little fish, seniors, pregnant and lactating women, those suffering from autoimmune diseases, as well as in order to enhance cognitive functions, alleviate skin problems, and prevent diseases of affluence. As a dietary supplement, take 1-2 capsules daily, preferably with a meal containing fat. Do not exceed the recommended daily dose. Dietary supplements cannot be used as a substitute for a balanced diet. Because of their chemical structure, polyunsaturated fatty acids are very sensitive to light and temperature. Protection of polyunsaturated fatty acids can be provided by vitamin E, which has antioxidant properties and protects the vulnerable compounds from oxidation. That is why fish oil supplementation is worth combining with preparations containing vitamin E.
fish oil (Anchovy), softgel capsule (bovine gelatin, glycerin, water). Polyunsaturated fatty acids (PUFAs) – contain at least two double bonds in their structure. They are most frequently divided into two subgroups: omega 3 and 6. PUFAs belong to essential unsaturated fatty acids – the body cannot synthesise them endogenously and they must be supplied with food. Their biological activity in the body consists in its role as a precursor to various eicosanoids. PUFAs promote mainly cardiovascular health. They are an effective preventive measure against cardiovascular diseases. They inhibit blood platelet aggregation, may lower blood pressure and triglyceride levels. Proper intake of polyunsaturated fatty acids is also of key importance to maintain a healthy brain. PUFAs promote normal development of the nervous system and its healthy function, thereby influencing beneficially cognitive functions. Their adequate consumption is believed to delay ageing processes. Supplementation with PUFAs is recommended to individuals on a slimming diet because they help control body mass. What is more, they may prevent the development of cancer. Deficiencies in polyunsaturated fatty acids in a diet may also promote immunodeficiency. Monounsaturated fatty acids (MUFA) - monoenoic fatty acid, contrary to PUFA - polyenoic fatty acid - may be synthesized in the human organism. Therefore, they are less popular in supplementation, although current research on their properties prove, that they are unfairly skipped. The main pro-heath application of monounsaturated fatty acids MUFA is prophylaxis of cardiovascular diseases. They may optimize lipid profile, increase the amount of lipoprotein HDL, at the same time decreasing the amount of “bad” cholesterol LDL. Oleic acid, present in olive oil, belonging to MUFA, is attributed the properties of Mediterranean diet, considered the best for our circulatory system. Some sources also say that monoenoic monounsaturated fatty acids are conducive to weight loss. Therefore, increasing their supply in a diet is recommended to people dealing with excess weight.